The Luxury German Automatic Watch is a beautifully designed automatic watch that stands out in the crowd. It comes with a 35 jewel automatic watch movement. Its large luminous dial displays the date, day of the week and month. This is a luxury watch with handsome black leather strap. 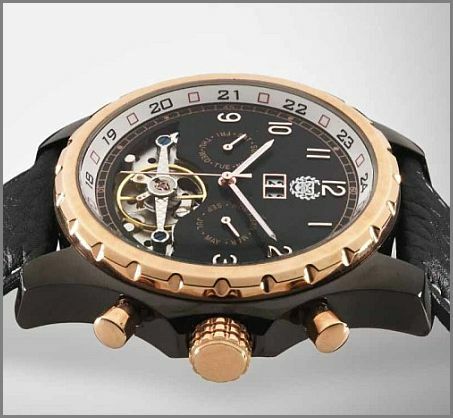 You�ll also love the many expertly crafted features of this mechanical watch. This luxury watch is characterized by its exclusive design and high quality materials. The German mark Kronwerk stands for innovation and reliability. This is German Watch Making at its best.